For inmates with disabilities who are routinely denied their mental or physical needs, incarceration can be a nightmarish fight for survival. 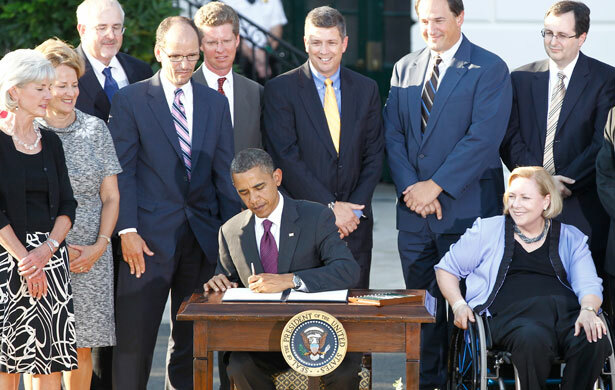 As he has every year since taking office, President Obama will likely mark the July 26 anniversary of the Americans with Disabilities Act with a public statement supporting the act, while acknowledging that its aim of equality is far from realized. Last year, he said that “despite the gains we have made, independence and freedom from discrimination remain out of reach for too many individuals with disabilities.” Possibly no group of people understands this so deeply as prisoners. Thomas’s story is not unique. Five years have passed since the American Civil Liberties Union (ACLU) and others started working on a class action lawsuit to force the Los Angeles County Sheriff’s Department into compliance with the Americans with Disabilities Act. Last last year, a judge finally granted class-action status to the case; meanwhile, prisoners in jails across the county have continued to say that they have to crawl on the ground for lack of mobility devices. ACLU lawyer Jessica Price is frustrated by the County’s inaction. “Each person who has to crawl around on the floor is, to me, an emergency, and it’s just not being treated that way,” she says. The emergency spans well beyond Louisiana and includes mistreatment of prisoners with different medical issues. In Alabama, HIV-positive prisoners, who wear white armbands identifying them as “infected,” live in a dorm where they can’t participate in substance abuse, work-release, or other programs. A federal judge deemed the practice discriminatory in December 2012. The only other state to segregate its HIV-positive inmates, South Carolina, announced on July 10 that it would stop its practice of segregating all HIV-positive prisoners; currently, even those with sentences as short as ninety days are sent to maximum-security facilities. Meanwhile, a pending lawsuit in Maryland targets the lack of assistive devices for deaf inmates, without which prisoners cannot effectively communicate with guards or use the phone to call people on the outside. Three more accessibility-related lawsuits involve corrections departments in Arizona, Montana and Pennsylvania. Of course, the biggest difference could be made by decriminalizing the poverty experienced by many (ordinances targeting panhandling and loitering disproportionately affect disabled people, for example), as well as decriminalizing certain drugs. In the absence of such meaningful changes, prisoners with disabilities will continue to be subject to some of the prison system’s worse excesses, for example, punitive solitary confinement. At the Los Angeles County jail, Columbus Grigsby, a Vietnam veteran diagnosed with PTSD, suffered two strokes that paralyzed the left side of his body in 2008. Apparently noticing that his right leg worked fine, jail administrators planned to take away Grigsby’s wheelchair and put the 55-year-old in the general population, which scared him, since he would have a hard time defending himself against any attacks by non-disabled prisoners. But prison staff also had a reputation for violence. Grigsby had witnessed another disabled man experience painful retribution for refusing to allow his wheelchair to be taken away. “They dumped a guy out of his wheelchair [onto the ground], and the deputy dragged him to his cell,” he said. Of course, the healthcare needs of disabled prisoners are not seen as a problem for those private companies that thrive off lucrative government contracts to provide healthcare. Correctional Healthcare Companies, for example, provides services for more than 70,000 inmates in twenty-seven states. In 2009, California—whose prison healthcare crisis led to a Supreme Court ruling ordering it to reduce its prisoner population—spent $845 million on privately contracted healthcare for prisoners. "This is the logic of the prison industrial complex,” says Eric A. Stanley, co-editor of the book Captive Genders: Trans Embodiment and the Prison Industrial Complex. Stanley and other activists are wary of the idea that reforms will bring major change. “The system isn’t broken” for companies like Correctional Healthcare, or for the many other corporations that benefit from mass incarceration. Toshio MeronekTwitterToshio Meronek is an independent journalist who has covered disability, prisons, and LGBT/queer issues for The Advocate, Huffington Post, In These Times, Truthout, and many others. He is also former editor of The Abolitionist, the newspaper of the anti-prison industrial complex organization Critical Resistance.